Not since the Game and Watch did I ever think I'd be writing about a watch-exclusive video game. So the Apple Watch is a thing that is happening, no doubt spurred on by the success of smartwatches such as pebble, and since it's a "big apple innovation" it's going to have a lot of sway with developers making programs for people who think simply being able to tell the time isn't good enough for a watch. 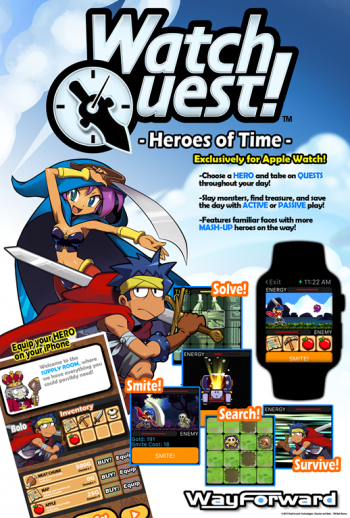 WayForward, our friends behind the DuckTales remaster from a couple years back, has just announced Watch Quest - an Apple watch exclusive RPG. Watch Quest stars Shantae and Bolo from the developer's Shantae series, and requires both a iPhone and an Apple Watch to play. Essentially, the phone acts as your "Kingdom" or home base, while the watch is the "Journey" that your hero takes. On your phone, you can equip your hero and upgrade items and such, while transferring them to the watch allows them to solve puzzles, fight bad dudes, and go on adventures. Think of it as a more advanced version of that Pokemon pedometer that came with Heart Gold/Soul Silver. "Players are invited to play passively by selecting longer, easier quests and outfitting the hero up front - or by taking on more difficult quests which require foraging for items as you go," WayForward said. The game will be available on April 24 - the same day the Apple Watch launches - and will be a free download with in-game microtransactions (as is the style for pretty much every single mobile game).